This year I’ve really enjoyed the usual spring flush of color in the garden. 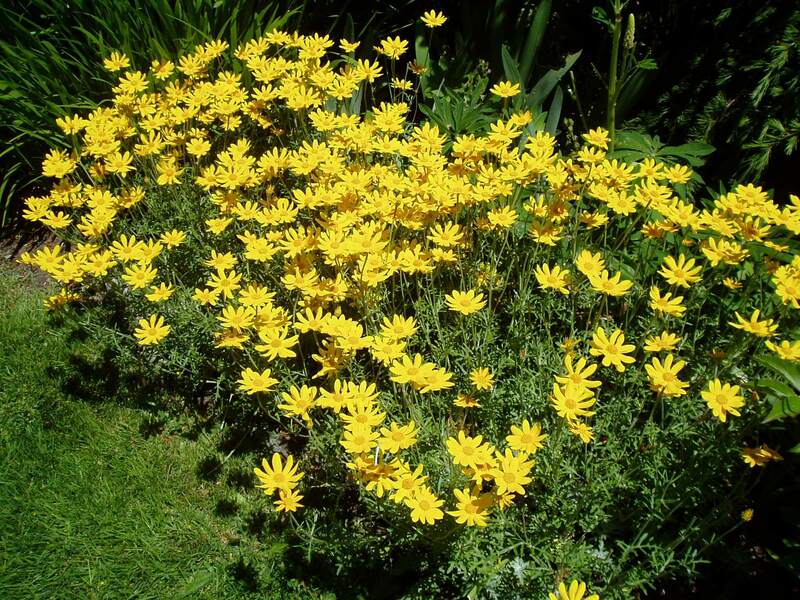 One plant, in particular, has attracted my admiration more than any of the others. 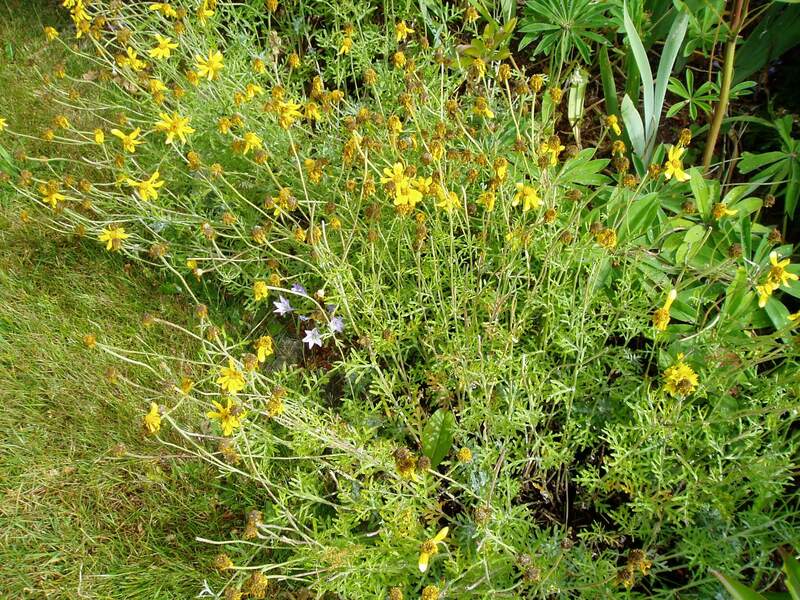 Wooly Sunflower (aka Oregon Sunshine & Eriophyllum lanatum) started blooming mid-May and didn’t stop until the end of June! The sunny, yellow, daisy blooms lasted as the peonies & rhododendron spectacles came and went. Hooray for Staying Power. 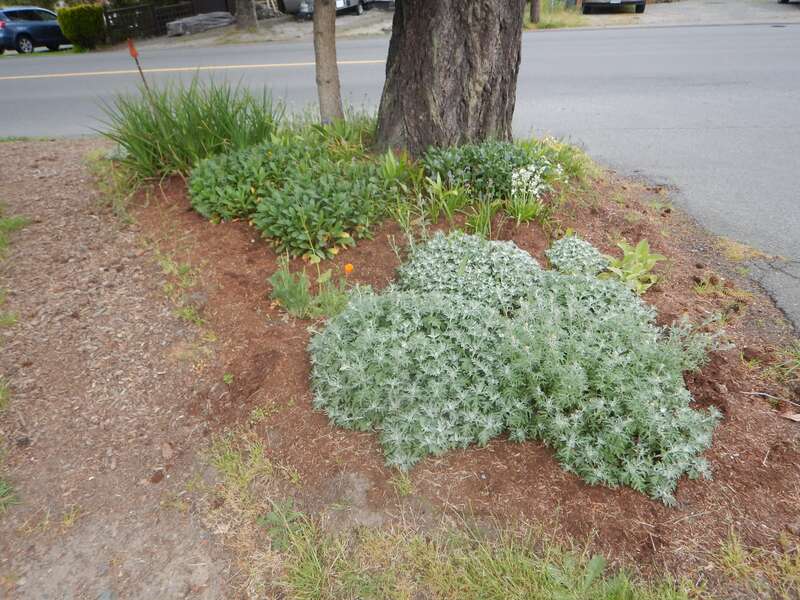 Deer leave it alone – – no missing flowers or over-pruned foliage. 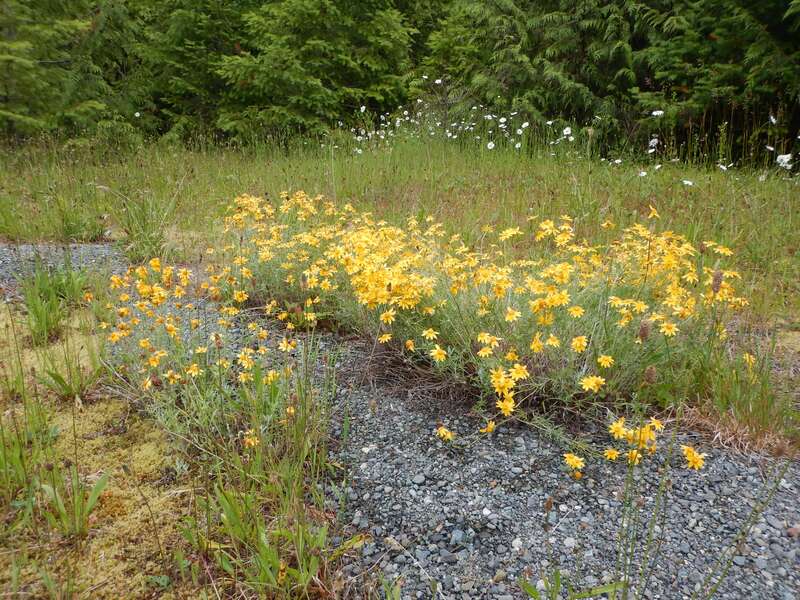 It attracts & feeds the local pollinators especially well because it’s native to our part of the world (southern BC & through the states to Mexico). It’s very drought tolerant. 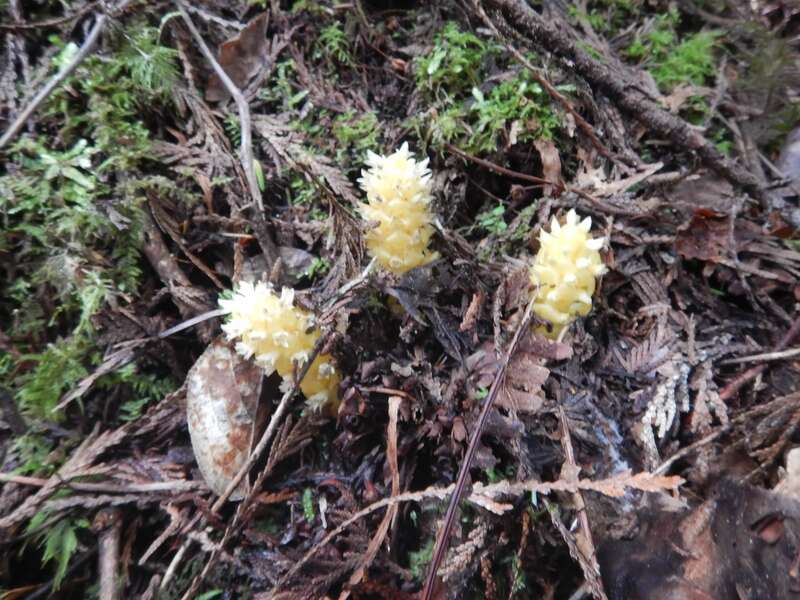 I’ve seen them in Strathcona Park, growing in the gravel of a roadside pull-out! They actually seem to do better with LESS water in our garden. The plants that I watered more regularly sent out long blooming stems that flopped over under the weight of the blooms. Once established, it’s easy-care. all I do is sheer off the spent flowers in July or August, creating a well-groomed look. In our climate, it’s evergreen – – or shall I say, ever-grey. It’s so nice to have the tidy mounds of foliage through the more barren garden of winter. Originally, I thought it would be an easy addition to our garden. I had a tough time getting the small 4-inch pots of Eriophyllum lanatum established. Although I watered them weekly, they struggled on our rocky outcrop – – a match to their natural habitat! After a couple of years, I was frustrated. What worked, in the end, was shifting the small starts to an area with deeper soil, that was still watered weekly but not baked in as much sun. The plants quickly grew, spreading to a foot wide in one season. They were a bit lanky & not terribly attractive, but had established a stronger root mass. 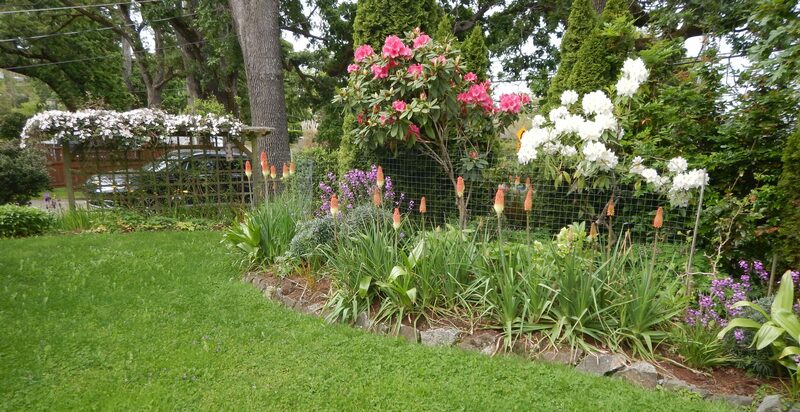 In the fall I divided them, keeping deep rootballs, & planted them into drier areas. They settled into their new homes over our moist winter & flourished with very little water through the following dry summer. 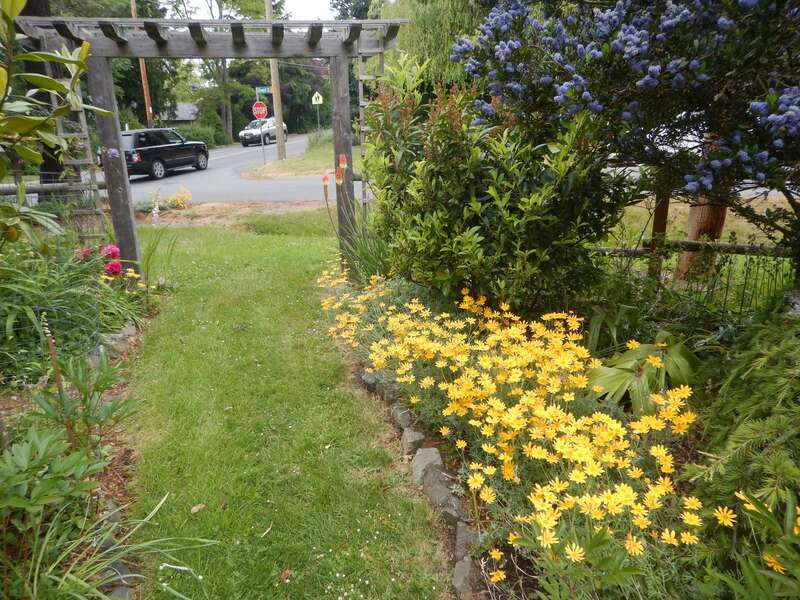 Now we have Wooly Sunflower in several areas: the boulevard, the rocky outcrop, & our more traditional flower garden. 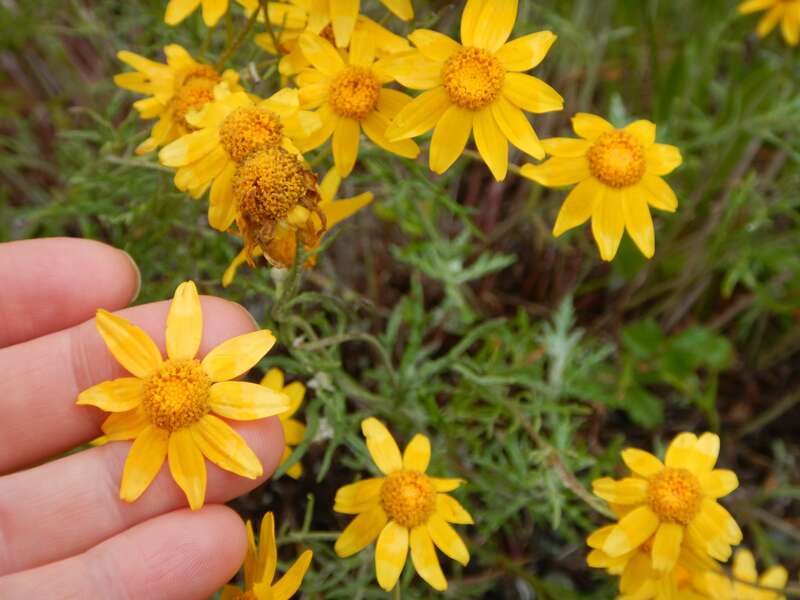 I’m on the lookout for even more easy-care native plants that suit….. 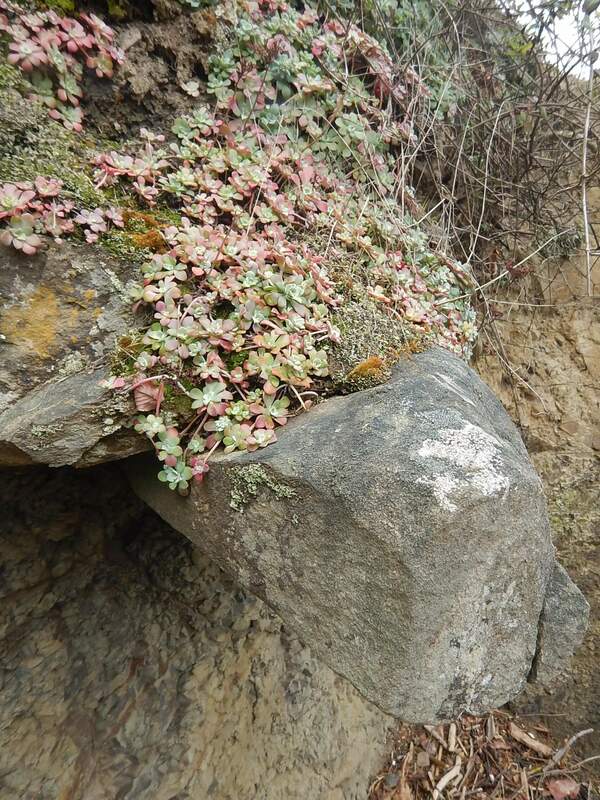 There it was, carpeting a cliff along the beach, one of the toughest plants I know. The rain drains quickly, rinsing nutrients from the rocky soil. 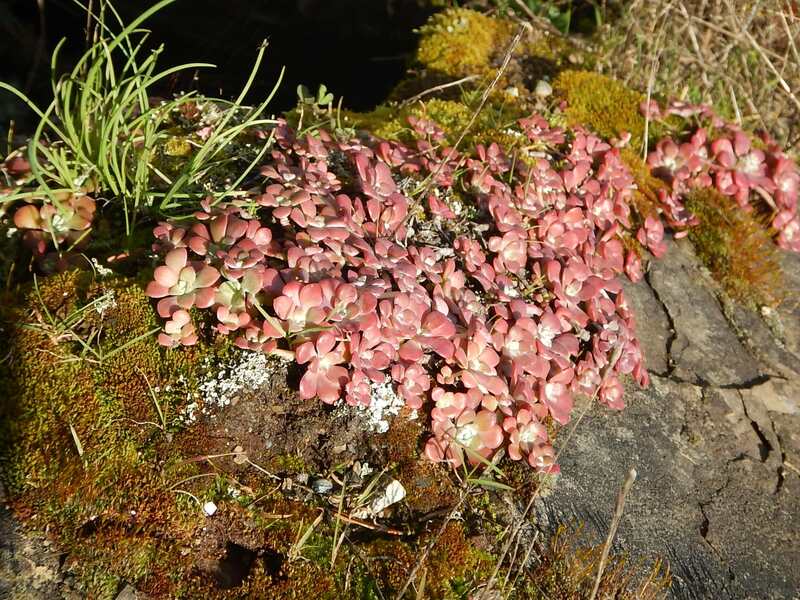 A suitable candidate for planting on a green roof? It clings & dangles tenaciously, spreading when leaning stems touch ground & sprout tiny roots. If a piece breaks off, it’s determined to grow right where it lands. It seems content in shade. 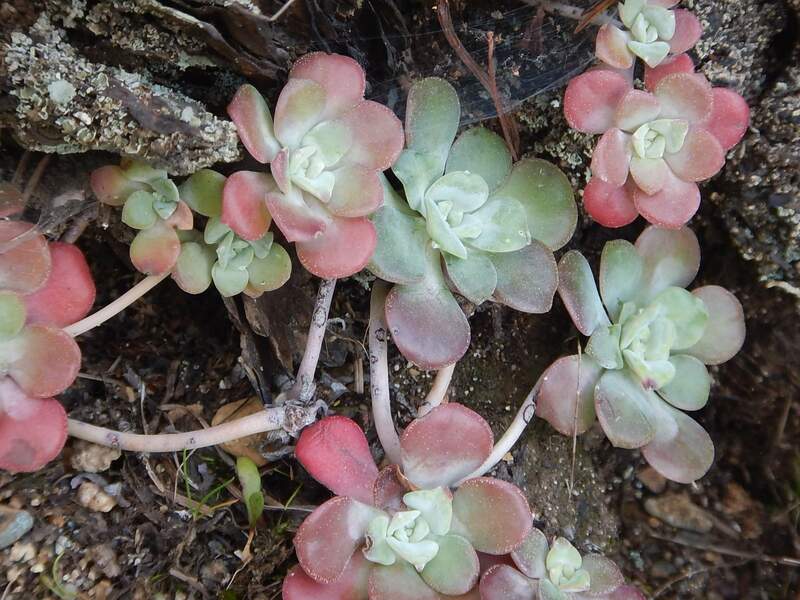 In the full sun, the succulent, spatula-shaped leaves change from grey-green to red. Who needs flowers when foliage is so decorative? 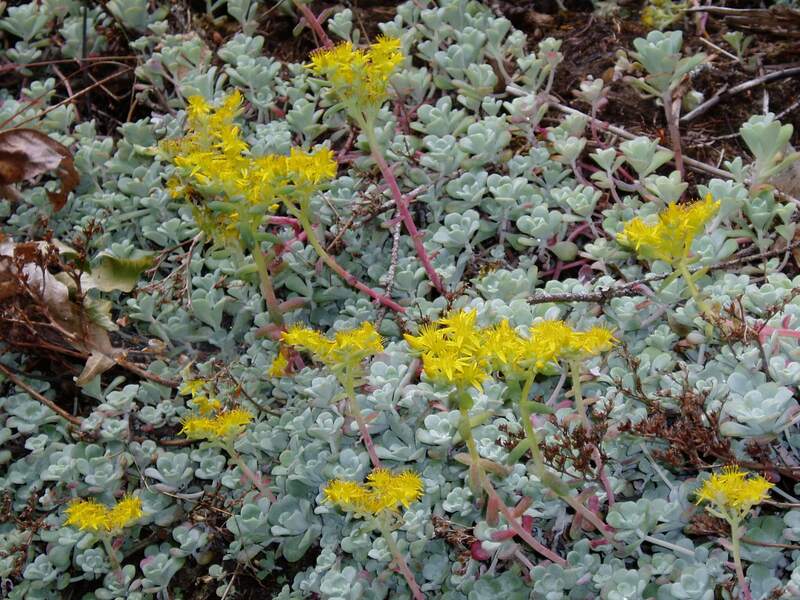 But Sedum spathulifolium blooms, too — starry, bright yellow flowers in June. Happy flowers. I welcomed this coastal native into my garden a couple of years ago & am not disappointed. Once placed in a gravelly patch, there’s not much to do with it. I leave it alone, & so do the deer. Score! It was high on my list to search for when we went camping with friends near Tofino in mid-May. On the very first day, a young friend spotted one & brought it to my attention. Score! It’s included in a list of ‘oddballs’ in my favorite field guide (Pojar & MacKinnon’s, Plants Of The Pacific Northwest Coast.) Who needs space aliens when we have mysteries like this on earth? Is it a flower? Mushroom? 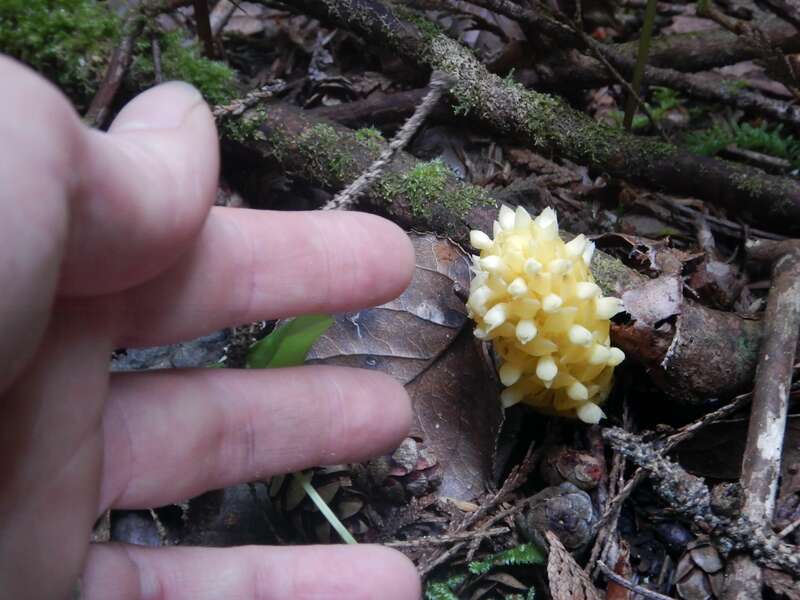 Fungi? It’s called a Vancouver groundcone, & I can see why. The shape is so similar to a spruce cone standing upright. Another name is Poque – an anglicized version of an indigenous word. The unusual coloring indicates the groundcone lacks chlorophyll, & that means it can’t produce its own sugars. For food, it depends on others. 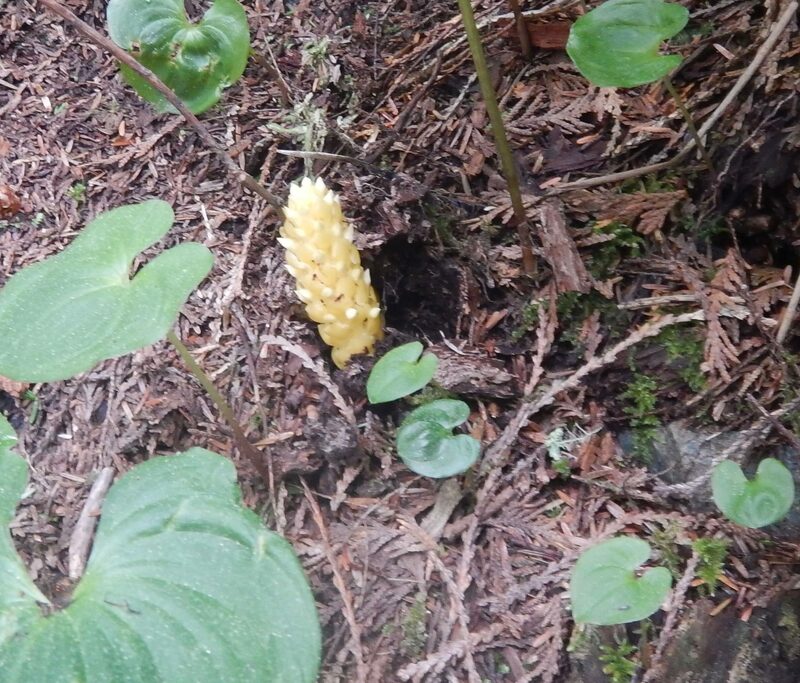 It’s a parasitic plant, that taps nutrients from a salal and sometimes kinnikinnick. Both salal & kinnikinnick are common on our coastlines, so you’d think there’d be plenty of groundcones. Perhaps there are more around, but I just haven’t been looking for them before? Boschniakia hookeri grows in the moist (summer dry) coastal lowlands from Haida Gwaii in Central Coastal BC to Northern California. This is the first time I’ve ever seen any. Go figure. Perhaps because they don’t need sunshine, they’re more common in shade, and more difficult to see? Aside from the yellow specimens I saw, Poque is found in a variety of colors from light yellow to brown to red or purple. I suspect the yellow contrasts more with its environment, so is slightly easier to spot. Once young WC showed me a few he’d spotted, I was able to find a few myself. 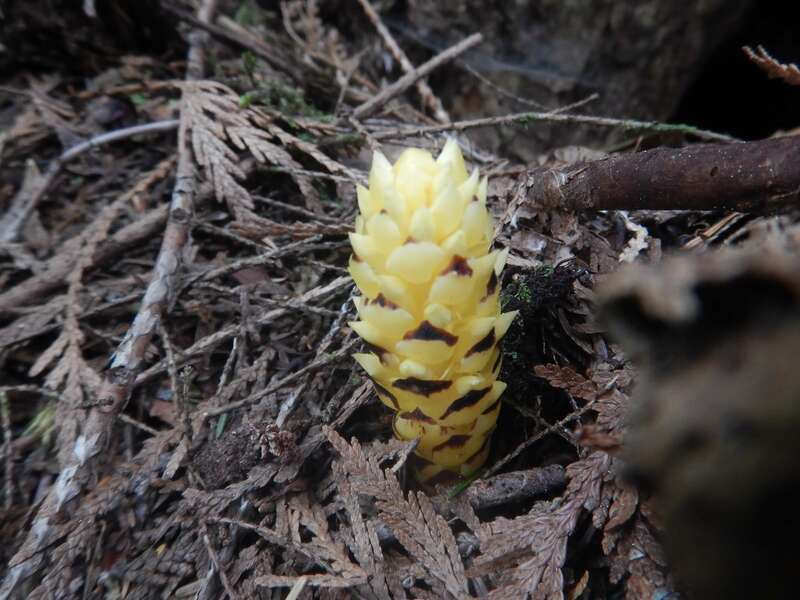 Now that I’ve checked this plant off my list, next up are more oddballs: Indian Pipe & Pinesaps. Wish me luck!